The last of the 4 I wrote, before Alex asked me to take over the writing of I’M FAMOUS! while he concentrates on Black Snow: Last Call. That’s write, I’m the temporary writer now and he just reviews or edits what I do. In today’s strip he added that very last line of Rosenstein’s. Since I’m doing the writing I thought I’d try some different things. Here I went for some larger meta jokes and broader commentaries about the general lack of creativity in movies for the last decade. Sometimes it seems there are no new ideas, only movies based on books, comics or remakes, and that’s what motivated this. Just look at how many old TV shows and comic books were adapted to feature films in the last ten years, simply ridiculous. What about that last panel? Another meta joke, on multiple levels. It plays off the idea that any comic book can be a hit movie, as well as the fact that we have been writing the script for a Black Snow movie. Will it ever really get made? I don’t know. If a studio wanted to buy it, then yes. It is fairly complicated and high budget, so it would be very difficult for us to make ourselves, unless we got significant financial backing. 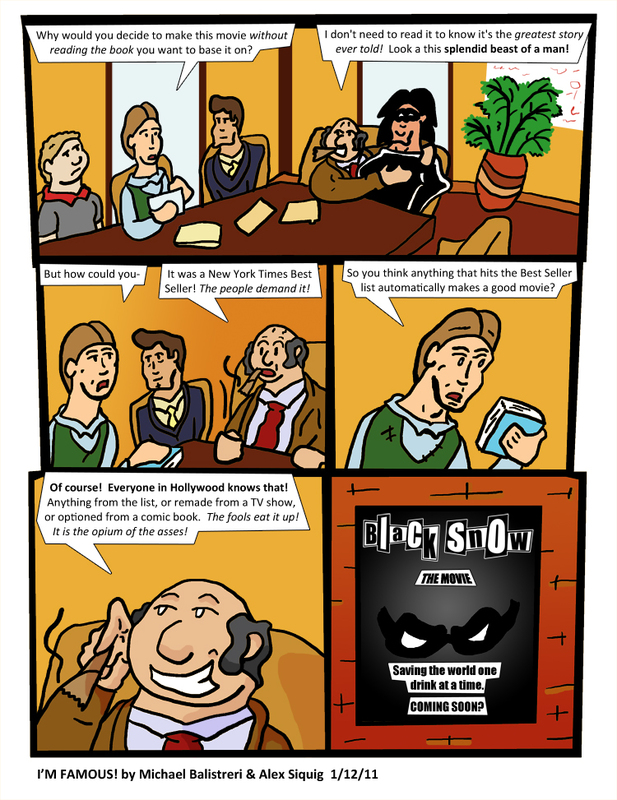 Does this mean Black Snow is getting his own movie in I’M FAMOUS!? Or that his comic book exists in I’M FAMOUS!? Not necessarily. I’m trying not to take it so seriously or worry about the strip being a cohesive story. I know Alex likes to treat it more like a traditional narrative, but I’m going to try and take a bit more advantage of the strip format while I’m writing it, and go on non sequiturs when I see fit. So get ready for!